LEXINGTON, Ky. — It hadn’t happened since 1980, but No. 19 LSU got a gutsy 73-71 road win over a Top 5 opponent as the Tigers took down No. 5 Kentucky at a raucous Rupp Arena in Lexington Tuesday night. 39 years. That’s a long time since head coach Dale Brown pulled that feat off in the same building. It’s also been quite a while since LSU basketball has been on the national stage at this point in the season. Like several wins this season, this one wasn’t without adversity for Will Wade’s Tigers, who trailed by eight at the break after shooting just 33 percent in the first half. The Wildcats also dominated on the offensive boards, grabbing six in the first half alone. 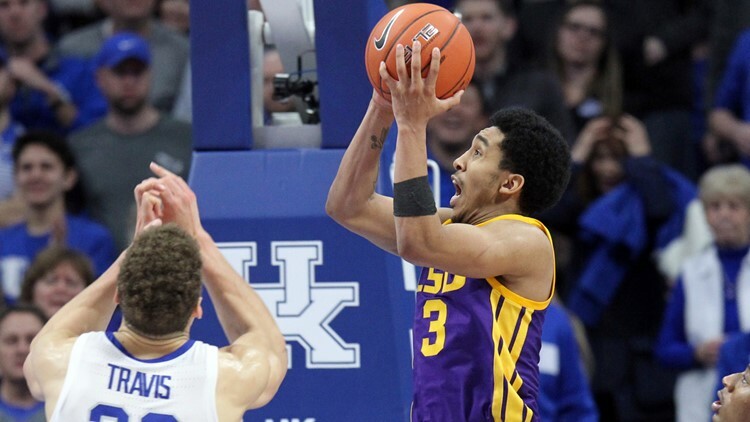 However, LSU came out of the locker room on fire, cutting the Cats’ lead to just three. That’s when freshman forward Naz Reid picked up his fourth personal foul, forcing Wade to bench him. Reid remained there for the next eight and a half minutes, and in his absence fellow freshman Emmitt Williams stepped up, scoring ten points over that span. Kentucky would tie the game at 71 with six seconds left. Then, junior guard Skylar Mays took the ball the length of the court for a lay-up, which rimmed out but was tipped in by senior forward Kavell Bigby-Williams as time expired. Despite a review to see if Bigby-Williams interfered with the ball while it was over the cylinder of the basket, the shot counted and the Tigers erupted as they exited the court. LSU is now 10-1 in the SEC, as they hit the road before a potential trap game at Georgia on Saturday, followed by home games against Florida and then top-ranked Tennessee on February 23rd. The Maravich Assembly Center will no doubt be rocking for that game against the Vols, which is already sold-out. Sell-outs at the PMAC have always showcased how great LSU basketball can be. Shaq and Chris Jackson enjoyed them in the late 80s. Big Baby and Tyrus Thomas were fueled by them in that spring of 2006. Now Tremont, Naz and this talented group of Tigers will get their chance to revel in one, as their dream run to the NCAA Tournament rolls on. Let’s hope it continues into March, and beyond.